Discovery of gold in 1858 brought prospectors to the area known today as Douglas County. Following the wake of gold seekers were business people, farmers and ranchers seeking their living from the new opportunities opened by the Pikes Peak or Bust Gold Rush. Lush native grass in the creek valleys spoke of good soil for cultivation and the thick stand of pines covering the hills answered the need for timber. The location of Huntsville, halfway between Denver City and Colorado City, in the shelter of the high butte, on a live stream, surrounded by heavy forest was a natural site of settlement. 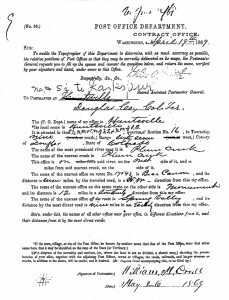 The post office application dated January 14, 1862 states; some 25 to 30 families and perhaps 150 lumbermen near it. 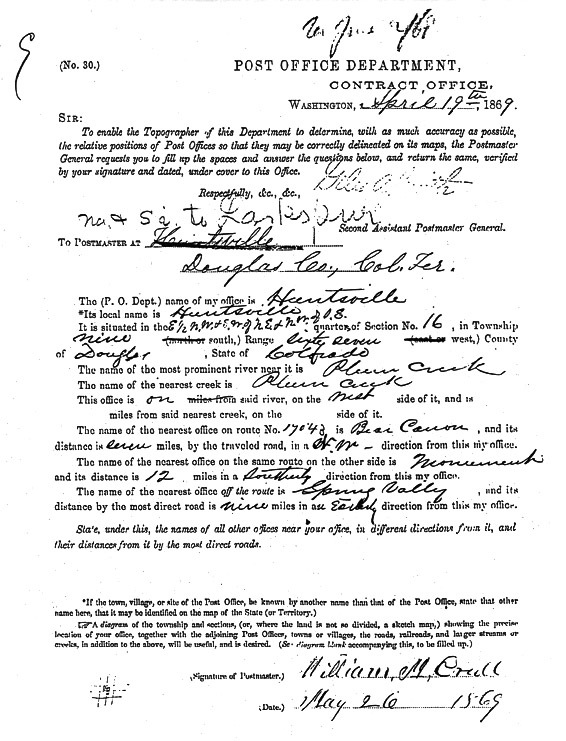 Testimony of the attraction of the valley is expressed in the words of the General Land Office survey or field notes. There are good farms in the valley of Plum Creek, June 29, 1866. With the creation of Colorado Territory in February of 1861, Huntsville became the first post office in Douglas County on January 22, 1862 with Daniel C. Oakes as postmaster for district 6. An earlier post office had been established on west Plum Creek on March 24, 1860, but discontinued by July 9, 1861. When the town of Huntsville on East Plum Creek was settled the post office was re-established at that location in 1862. Mail came to Huntsville, located below Hunts Mountain, about two miles north of present day Larkspur. This first post office was discontinued on August 29, 1867 and later re-established in April 8, 1869 with William Crull acting as the second postmaster. Huntsville, so named for Alexander Cameron Hunt, Territorial Governor of Colorado in 1867, was laid out circa 1859 by Sarah Coberly, the first white woman in the Pikes Peak region. Mrs. Coberly established Coberly’s Half-Way House hotel to accommodate early freighters and stagecoach travelers along the territorial Road coming from Auraria (Denver) along East Plum Creek to Colorado City (Colorado Springs). The settlement, located midway between the two cities, included a stage stop, Coberly’s Hotel, Oakes Mill (saw mill) run by Major D. C. Oaks and served as a supply center for local farmers and ranchers. Rhyolite, heavy timber and clay made this area a choice site for trade. Major Oaks, one of the first to arrive and search for gold in Colorado Territory in 1858, helped spark the initial gold rush to the Pikes Peak region by publishing a goldfield guide to the Pikes Peak area. During the Indian uprisings in the 1860s, a nine room log stockade known as Fort Lincoln or Oakes Folly was built on the Crull Ranch at Huntsville to protect nearby ranchers from attack. Thirty families took refuge for six months in 1864. Sarah married William Crull on May 7, 1865 after her first husband was killed in 1864. The Crull’s left Huntsville and moved to Denver circa 1870. By September of 1871 the tracks of the Denver and Rio Grande Railroad had reached the new community of Larkspur, south of Huntsville and the Huntsville post office was re-named Larkspur and located in the Denver and Rio Grande depot. It is interesting to note that the Larkspur post office has been in continuous operation since 1871. The Denver and Rio Grande Railroad tracks followed the old Territorial road from Castle Rock to Palmer Lake and later on to Colorado City. The trail system in Greenland travels a portion of the original road. In 1899, with the efforts of Senator Ammons of Douglas County, a bill appropriating $5,000 for a bicycle path from Littleton to Palmer Lake and eventually to Colorado Springs and Pueblo was passed. This path would follow this Territorial road as it traverses to Palmer Lake. Larkspur, named for the flower, which grows abundantly in the area, then became the railroad town with freight of gypsum, clay, lumber, creamery products and a passenger line. Ultimately the stagecoach route to Huntsville was discontinued and Huntsville was a ghost town by 1890. Two floods have compromised the land surrounding the Huntsville area, the first on May 7, 1864 destroying the Oakes sawmill and much of the town, the second flood in June of 1965, that flood changing much of the terrain around the base of Hunt Mountain and certainly washing away any remaining material that might have been obtained from an archaeological study of the area. Deep scaring, gouged by the torrent of rainwater from both storms, still show on the west side of Hunt Mountain. Slowly, vegetation is reclaiming the earth laid bare by the forces of nature so long ago.